Chris Cornell who co-wrote and recorded the track You Know My Name - the theme to 2006’s 'Casino Royale' has died at the age of 52. His representative, Brian Bumbery said his death was “sudden and unexpected.” Just hours earlier, Cornell had played a full, 20-song Soundgarden gig at the city’s Fox Theatre venue. Cornell grew up in Seattle, Washington. He formed Soundgarden alongside guitarist Kim Thyail and bassist Hiro Yamamoto in 1984. The band was launched at the heart of the grunge movement. Audioslave sold more than 10 million albums in the US alone and was nominated for 9 Grammys, winning two. The band split in 1997 but reformed in 2010. 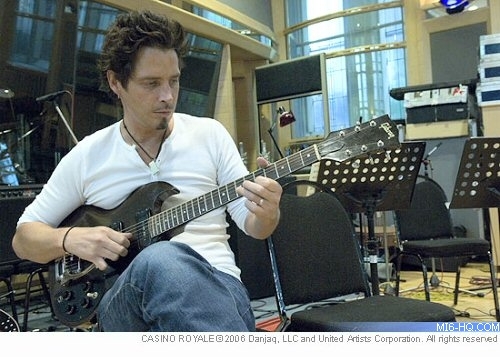 In 2001, Cornell formed Audioslave, which he fronted alongside former Rage Against the Machine members Tom Morello, Tim Commerford and Brad Wilk. Cornell later wrote the track, The Keeper, for Marc Forster’s 2011 film 'Machine Gun Preacher' and earned him a Golden Globe nomination. He most recently released "The Promise," for the upcoming movie about the Armenian genocide of the same name. Music MI6 looks back at the history of the Casino Royale soundtrack and the title theme "You Know My Name"
Casino Royale (2006) Chris Cornell spoke on British radio recently about his work on Casino Royale and the process of writing "You Know My Name"